Here are twenty-one ideas for using Instagram strategically but authentically to build a vibrant, active community that includes new coaching clients. Use your one link that your profile allows to go to a targeted landing page—one that contains a clear, strong call to action (e.g. “Sign up for my giveaway”). 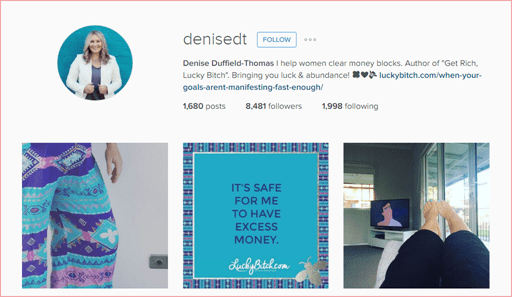 Denise Duffield-Thomas’ example in the previous Idea is a perfect example of this. Notice that she doesn’t miss a trick to find ways to do so creatively (e.g. turquoise toenails). You’ve seen it all over the place: The usual gang of social media sharing badges—but they don’t usually include Instagram’s. Nothing gets cross promotion more quickly than doing it yourself for others. Remember that your peers and fellow experts are also part of your community. When you promote them, you show friends and followers alike that you care about the community; not just your own interests. This doesn’t mean “use as many hashtags as you can”! 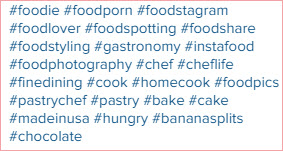 While Instagram is generous with hashtags, allowing users to include up to thirty hashtags—don’t. Choose only hashtags most relevant to your topic and brand. People tend to click away from visual “clutter”—which is what multiple hashtags with a photo produce—and they won’t read and share the hashtags as much if you include less than half a dozen. Select only the most important hashtags for each individual photo, the type of viewer you want to attract—and your brand hashtag. Better than using a bunch of hashtags, put your efforts into creating one that stands out and catches on like wildfire. For example, what could be easier than snapping a photo of your own feet? 8. Post Your QR Codes on Instagram! Either feature just the code to get people to click on it and see what it’s for—people love a mystery—or edit your QR code into a photo with a message that’s relevant to the QR code. You can easily create your own QR code such as the ones featured above at free sites like QRStuff, which also allows you to create a QR code specifically for Instagram by selecting Instagram from a list. Several social media management app companies make it easy to do this—such as Woobox and Wishpond. There is absolutely no reason not to create an Instagram tab for your Facebook Page—and every reason to do so, if you want to increase lead generation and get more coaching clients. Running an Instagram contest with actual prizes? Be sure to photograph your prizes (or have the donor do so) to give your followers even more incentive to enter. And don’t just take a snapshot: Stage your prizes against an appropriate backdrop or in a relevant setting, to give them even more appeal. While you can always write to each individual and ask permission, if you’re planning to use contest photo entries for future promotion, better to put those terms directly in your contest rules and guidelines; and in contest announcement or blog posts. It’s always a good idea to let people know about things like contests via more than one method—even if the contest is exclusive to Instagram. Your subscribers may appreciate a cheerful heads-up about your fun contest, so be sure to let them know about it by email too (including rules, what to do and what hashtag to use). Make sure your email Subject Line announces your fun new contest clearly or mentions your irresistible prize, and finish your email body with a call to action. Here’s another place where many brands on Instagram fall down flat: Once the contest is over and the winner chosen, that’s it. Don’t be one of those brands. Promote and praise your winners. Share their winning photos on Instagram—and elsewhere. Interview them about their motivations and inspirations, and feature profiles of your top winners on your blog… and do ask for a quote from each one that you can share with your followers. As a coach, the last thing you want to do is inundate your photo with multiple hashtags and too much text. It’s better to make one short point simply, with no more than two totally targeted hashtags, than make people’s eyes glaze over as they try to make sense of large blocks of text. 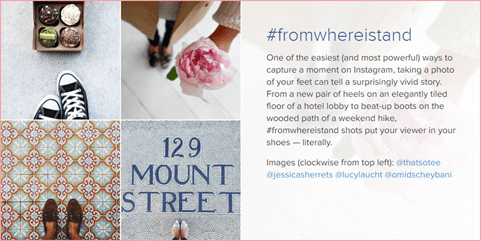 Want to keep people looking for your Instagram posts? Share photographs that inspire and encourage. Make them laugh when things are dark. Remind them to be kind to themselves. Let them know you are sure they can do it. Pair your photo with an encouraging hashtag they’ll learn to remember and look for, and use the heck out of that puppy. Here’s a tactic you don’t often hear about with Instagram: Direct Messaging. Use it to send gifts to new followers, share a coupon code or advance notice of something important; or simply let a follower or peer know that you particularly appreciated something she did, said or posted. Make it feel relevant, real and personal (the last thing you want it to feel like is annoying pop-up spam). 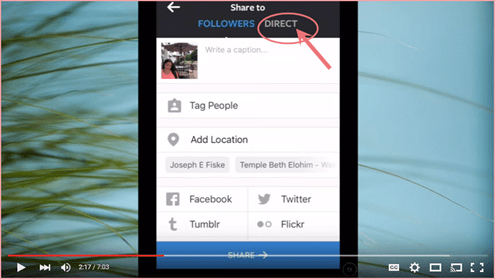 Check out coach Sue B. Zimmerman’s YouTube video on How to Use Instagram Direct Messaging to see how this works. Why will she care about this? What will she take away from it? What value does it add to her day? Is this post for my satisfaction or my followers? Getting into the habit of running this mental checklist before every post will help you keep your content focused on your client—as well as on your brand. Do you get the most reaction from inspirational posts? Personal posts? Tips? Article links? Funny posts? Videos? Make a note of which post types gets the most reaction from your community, and build more of them into your post planning. There may be times a square photo really will not suit what you want it to say. If that’s so, select the Camera icon; then click the double arrow icon in its circle (lower left of your screen). Your followers will see the photo in landscape mode at its original size. One caution, however: In your feed, the photo will show as square, so make sure that the most important elements of your composition are positioned correctly. Sometimes going candid is a great way to thank people, give them shout-outs, inspire them, cheer them up or motivate them—all the things you do separately with other types of posts. For example, you could post a photo of something that makes your day better—a bar of luxury chocolate or a cappuccino. Or your assistant grinning up at you as she cuts out hearts for a Valentine’s Day promotion. Or a new piece of equipment that is going to make your life better. Or an old piece of equipment being donated. Or the lunch you’re serving at your VIP day—anything at all… as long as it’s something your followers can relate to (and your staff appreciates!). Instead, it should make your followers happy every time you post. Always be on the lookout for creative ways to do this, and you’ll have as much fun on Instagram as your followers will have with your posts.